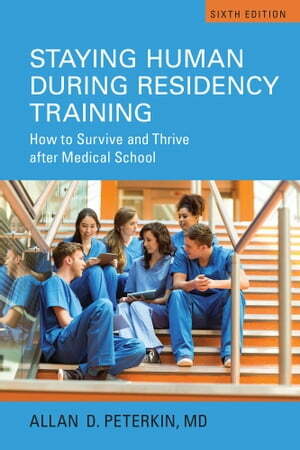 Collins Booksellers - Staying Human during Residency Training by Allan D. Peterkin, 9781442629158. Buy this book online. The ultimate survival guide for medical students, interns, residents, and fellows, Staying Human during Residency Training provides time-tested advice and the latest information on every aspect of a resident’s life – from choosing a residency program, to coping with stress, enhancing self-care, and protecting personal and professional relationships. Allan D. Peterkin, MD, provides hundreds of tips on how to cope with sleep deprivation, time pressures, and ethical and legal issues. This sixth edition is not only updated to reflect the latest research and resources, but also features new material on the latest issues in residency training, including social media use, patient-centred care, the medical humanities, and the “hidden curriculum” of residency. Presenting practical antidotes to cynicism, careerism, and burnout, Peterkin also offers guidance on fostering more empathic connection with patients and deepening relationships with colleagues, friends, and family. Acknowledged by thousands of doctors across North America as an invaluable resource, Staying Human during Residency Training has helped to shape notions of trainee well-being for medical educators worldwide. Offering wise, compassionate, and professional counsel, this new edition again shows why it is required reading for medical students and new physicians pursuing postgraduate training.